Forum "Medical Diagnostics - 2018"
President of the Congress "Radiology - 2019"
of the Forum "Medical diagnostics"
1.1. In order to identify and support talented young researchers, promote the professional growth of young scientists, encourage creative activity of young scientists in conducting research, the All-Russian National Congress of Radiation Diagnostics and Therapists once a year awards a prize to young scientists named after Professor Yu.N.Sokolov for best scientific work on radiation diagnosis. 1.2. The competition for the award to young scientists is carried out under the section "Radiation diagnosis." 1.3. For the award to young scientists accepted scientific work performed by the authors themselves. The author of a scientific work, recognized as the winner of the competition, is awarded a laureate diploma and a prize of 1,2,3 degrees. The outstanding clinical physician - roentgenologist Yury Nikolaevich Sokolov was born in Moscow in 1905. Yury Nikolayevich’s father was a lawyer, his mother was one of the first X-ray technicians in Moscow. After graduating from Moscow Institute of Medicine in 1930, he worked as a doctor for 2 years and in 1933 he entered the postgraduate school of the Moscow Institute of Roentgenology and Radiology. In 1936, Yu.N.Sokolov defended his thesis in which the influence of X-rays on the Arthus phenomenon and allergic reactions was studied. 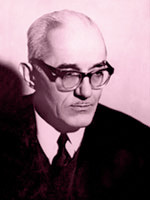 In the same years, Yu.N.Sokolov began his pedagogical activity, working part-time as an assistant at the Department of Radiology at the Central Medical University of Doctors. Meeting of the Organizing Committee Forum "Medical Diagnostics-2018" and the Congress "Radiology-2018"
On Tuesday, October 24, 2017, a regular meeting of the working organizing committee of the Forum "Medical Diagnostics - 2018" and the national congress "Radiology - 2018" took place.